Sunderland clearly set up a game plan to try and stifle Arsenal’s passing game and when they got the chance looked to attack on the counter. 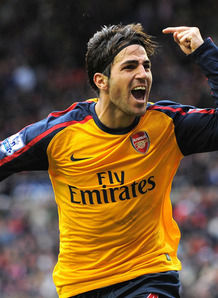 It was clearly a game plan to come away with a draw or if possible a 1-0 win and one which frustrated the Arsenal play. Arsene Wenger started with a 4-3-3 formation with Walcott and Van Persie on the wings as he looked to counter the number of men Sunderland were bound to have in the middle of the park but didn’t expect the Black Cats would employ the tactic as negatively as they did. They were very organised and lacked much ideas. The midfield five sat in a line in front of the defense to stop Arsenal from playing through them and finding any gaps. 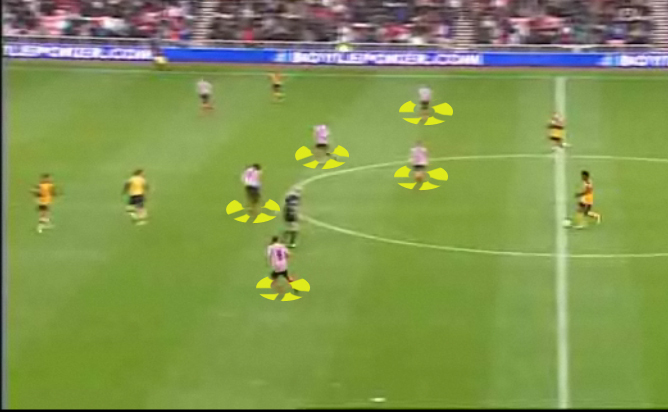 Here is an example of Sunderland employing such a tactic. A five man midfield line sat in front of the defense to try and break down the Arsenal play and when they did get the ball counter with Cisse’s pace. The fact that Sunderland put 10 men behind the ball and pack the midfield was the reason Arsenal found it difficult to play and hence the outcome of the match. But was about Arsenal? Surely they could have been more intelligent, both from the manager and the players. Cesc Fabregas played higher up than any of the midfield three of him, Denilson and Song. This meant he had to play in between Adebayor and the packed midfield to try and make break Sunderland down. In theory the Gunners’ most creative force playing more higher up the field would create more chances however a mixture of (mainly) a packed Sunderland midfield and a lack of movement from the rest of the team denied him. The midfield have to do more attacking wise (more on the new strategy used by clubs and the evolution of the striker tommorow) and provide more of a goalscoring threat. Playing higher up meant he couldn’t dictate the game as he does and would have to receive the ball from Song and Denilson before he could create. Sometimes he would drop back meaning Adebayor would then be isolated and the gap in between midfield and attack where the danger should be becomes vacated. The blame is not shifted to Fabregas at this point, only the players around him should have done more to get involved. There was a lack of runners from midfield and the wide men stuck wide and when they got the ball where there a lack of men in the box. Also to be noted the crossing was poor. Here you see where the movement was poor. 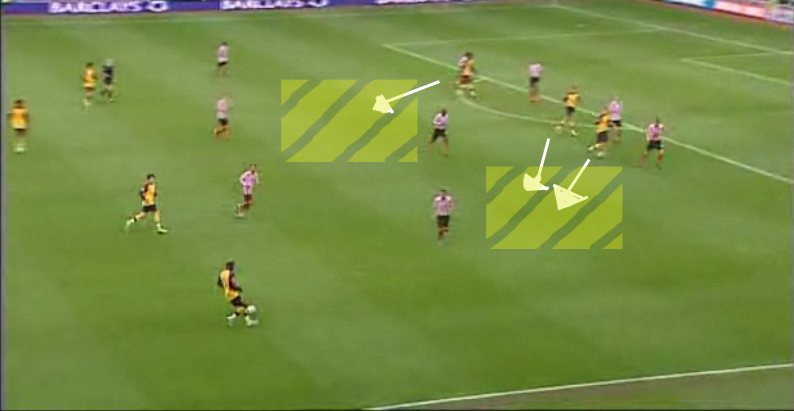 The midfielders need attackers or another midfielder to drop or run into the shaded area. This was his area and if he did leave it nobody took the initiative to make something happen. Wenger picked a formation he thought would be best suited to beat Sunderland but he didn’t realise how negative they would be. Was this a case of Wenger showing too much respect to Keane by saying ‘well down for working us out so we’ll change it as we won’t beat you playing our normal way?’ Overall a very negative tactic from Sunderland and one where Premiership challengers Arsenal should do better. As ever, some very good analysis. I think the pace and movement of Cissé made it very difficult for the full-backs to push forward safely, which led to us playing far too narrowly considering how compact their midfield was. With 10 men behind the ball, I also believe more directness was needed to pull players out of position and create more space for others. Walcott was our only outlet of directness yesterday, but his final ball was generally poor, whilst he struggled to keep hold of the ball under such pressure. Thanks Stu. You are right; a bit more directness would have been better. The midfielders could have made better runs to the box such as Song did. We tried to play through them rather than get through them first. DaStuDawg : Ur comments have been helpful as I’ve not got much. Thinking about packing it in as I’ve seen far too many blogs which have worse contet than me get comments. Please don’t pack it in. 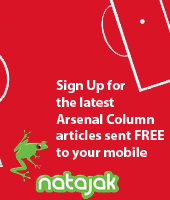 I don’t think I have seen any Arsenal blog with as much thought and effort put into it. Many blogs simply pass on information. As useful as that can be, I much prefer thought-provoking insight into matches, tactics and systems implemented. The first time I heard of you was through the 606 BBC Forum. I’ve noticed you’ve stopped promoting the website there as of late, so I would recommend you keep looking to advertise on such forums whilst awareness builds. I think your blog is unique, and whilst I understand it costs money, I would urge you to keep the sight running, as it has the potential to go far. Definitely my favourite Arsenal website currently!